I was on the phone to my mom the other day when she told me she was in the middle of baking blueberry pudding. I could almost smell it over the phone - such are the memories of how good it is. It spurred me to go out and buy some blueberries from the local food market and I rang her the next day to get the recipe. Yesterday evening was my testing phase - how do I make this incredible recipe gluten free? As the ingredients and methodology are simple enough with the flour being the only thing that needs to be substituted, I decided on using Doves Farm Gluten Free Plain White Flour. It turned out to be the ideal choice and I was delighted with the result. So after yesterday evening's success of baking my first ever blueberry pudding - I figured I might as well share the recipe! I use the cups measurements for baking so please see me 'Cups For Cooking' tab for conversions. Preheat your oven to 180 degrees C. I use a convection/conventional oven, so I think you may want to lower the temperature a bit if you are using a fan oven - maybe by 20 degrees C. Place an oven rack in the middle of the oven. - Generously butter a deep (can hold around at least 2 pints) ceramic or metal oven proof bowl. 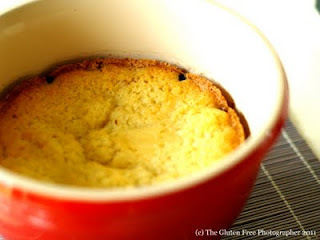 - In a medium sized bowl, beat together the sugar, butter, milk and egg with an electric mixer until light and fluffy. - Using a rubber spatula, blend the gluten free flour, baking powder and salt. Stir in the vanilla. - Spread half of the blueberries in the bottom of the oven proof bowl. 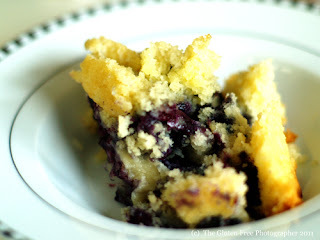 - Pour the batter over the berries and spread the remaining blueberries evenly over the top of the batter. - Cover the bowl tightly with foil and place in the centre of a large roasting pan. - Pour boiling water into the roasting pan until the water is half way up the sides of the bowl (a bain-Marie). - Depending on the thickness of the bowl you're using, bake it for at least an hour and a half. I used a creuset bowl and it needed to bake for at least two hours before it was baked through. - You'll know it's cooked when you place a skewer or cake tester in the centre of the pudding and it comes out clean. Have patience, the pudding is lovely and cakey when cooked through properly, so don't take it out too early or it will only be cooked on the top and not right through to the bottom. - Serve with sweetened whipped cream (for the recipe see my 'Dark Days , Dark Chocolate' blog post) or vanilla ice cream.